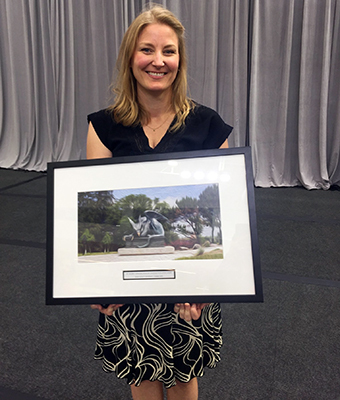 Professor Lianne Foti received the Dr. William Winegard Exemplary Volunteer Involvement Award at this morning’s U of G Community Breakfast, which is an award that recognizes significant community involvement and charitable activities beyond what an individual does as an employee or student of the University. Foti was recognized for the “My World My Choice” program, which encourages children to take action on sustainability projects at their schools. Earlier this year, the program worked with Rickson Ridge Public School to challenge their students to grow as leaders in their school and community. Lianne Foti is an assistant professor in the School of Hospitality, Food and Tourism Management. Congratulations!